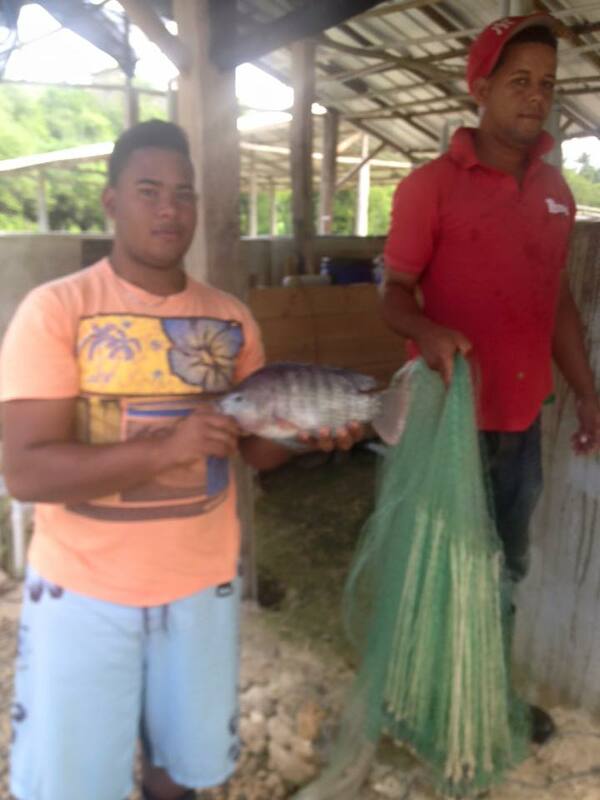 Taino Farm is proud to have the only commercial aquaponics system in the Dominican Republic and one of the few tropical aquaponics systems in the Caribbean. Aquaponics is the re-creation of a natural ecosystem with the focus of manipulating the Nitrogen cycle to work for your growing needs. It is the combination of Aquaculture (the growing of fish) and Hydroponics (the growing of plants in a soilless media). 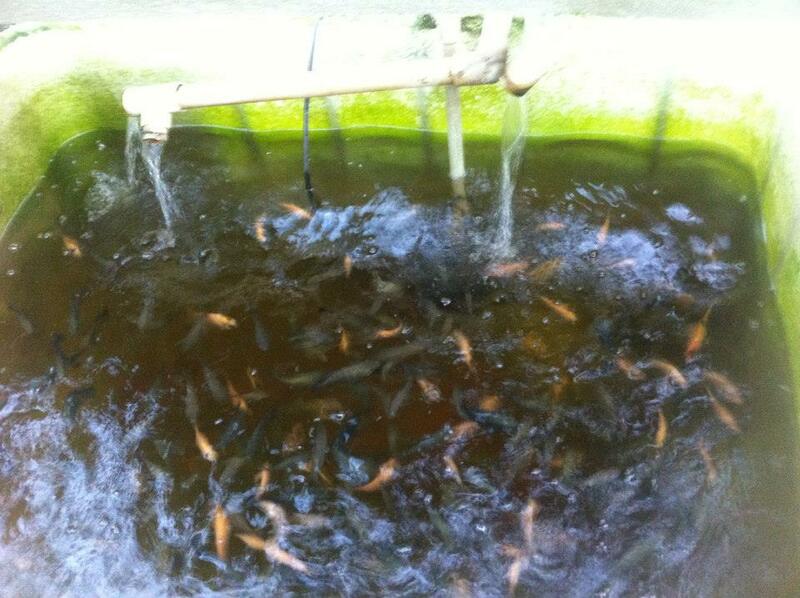 The three most important organisms in an aquaponic system are the fish, nitrifying bacteria and the plants. Fish produce Nitrogen in the form of Ammonia both from breathing through their gills and through their waste. When in a closed tank system, if the Ammonia level becomes too high it can cause harm and death to the fish. As the waste filled water is removed from the fish tank it must be accessed by two kinds of nitrifying bacteria in order to convert the Ammonia into Nitrite then into Nitrate. Nitrate is the form of Nitrogen is readily accessible to plants and plays an important role in healthy growth. The bacteria in system must have a large enough surface to live on where the dirty fish water can pass through in order for all of the Ammonia to be changed into Nitrate. The Nitrate filled water then must make contact with the plant roots in the system so that the plant can uptake the Nitrogen and use it for growth. After the water has passed through the plant roots it should be completely free of all forms of Nitrogen and therefore is clean and may be recycled back into the fish tank. In an efficiently running aquaponic system up to 90% less water is used than conventional growing systems. 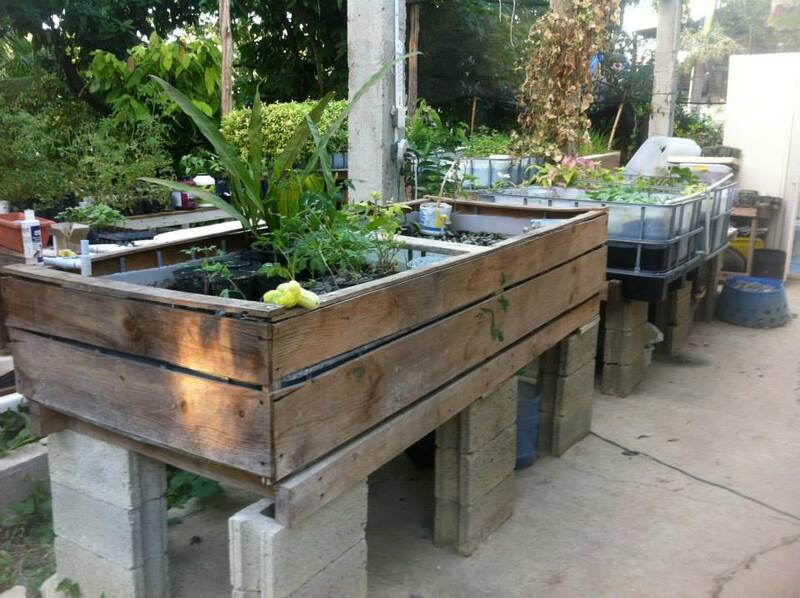 There are two types of aquaponic growing systems here at Tiano Farm, Media Beds and Floating Rafts. Our Media Beds are made from an IBC tank cut in half, one being filled with water and fish and the other with rock media, bacteria worms and plants. Plants grow directly into the rock media that is constantly flooded and drained with water from the fish. The worms live in the rocks and break down the solid fish waste into a form of nutrients the plants can use. The bacteria also live on the rocks and change the Ammonia to Nitrates for the plants. 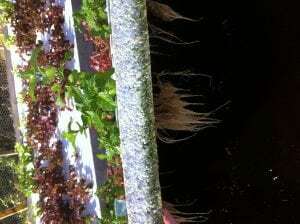 The plants then clean the water of nutrients and it is recycled back into the fish tanks. 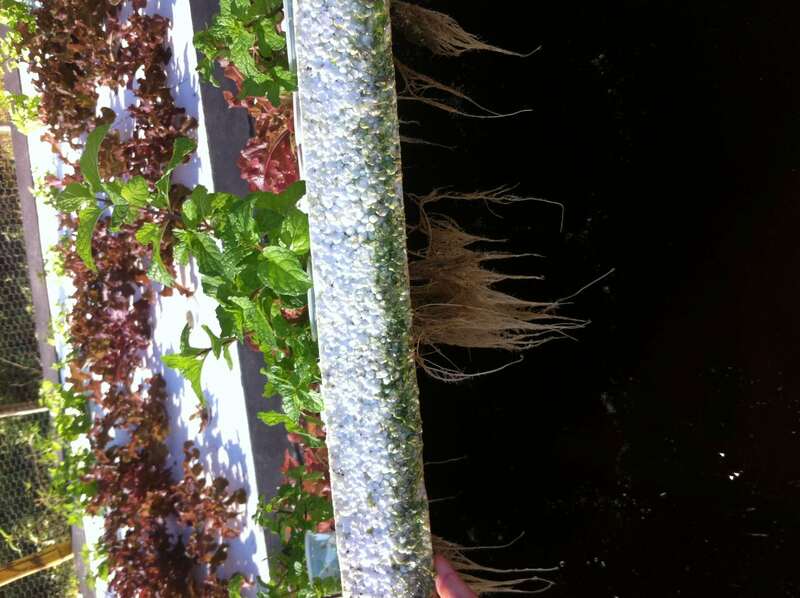 The Floating Raft system is a different form of growing where the plant roots are grown directly into the fish fertilized water. The plants are placed in Styrofoam that float on top of the water and the roots hang into the water to clean it for the fish. In this type of growing system because there are no rocks present, the solids must be removed from the system because there are no worms to break them down. Also, there is no surface area for the bacteria to be grown on so there must be another home for them called a bio filter present. We use plastic balls and mesh for them to live on in our system. The solid and bio filters must be separate from the fish tanks and plant beds. The ammonia filled water leaving the fish tank must first go through the solids filter, then the bio filter, into the plant beds for the plants to use the nutrients and clean the water to be recycled back into the fish. Hatchery: This is where the tilapia are born. It is divided into 10 x 150 gallon tanks that host breeding sets of one male and 4 females. We have 3 Super YY males, and the other males are a mix of Red, Nile and Mozambique tilapia. Most of our females are from local sources to ensure adaptability. Included in the hatchery is our homemade incubator, where we collect the tilapia eggs to ensure a higher birth rate. The nursery serves as a grow out location for our fingerlings, from month one to month three. In the nursery we propagate plants to go into the commercial aquaponics system and into our vermiculture garden. The nursery is composed of 3 x 250 gallon IBC tanks. 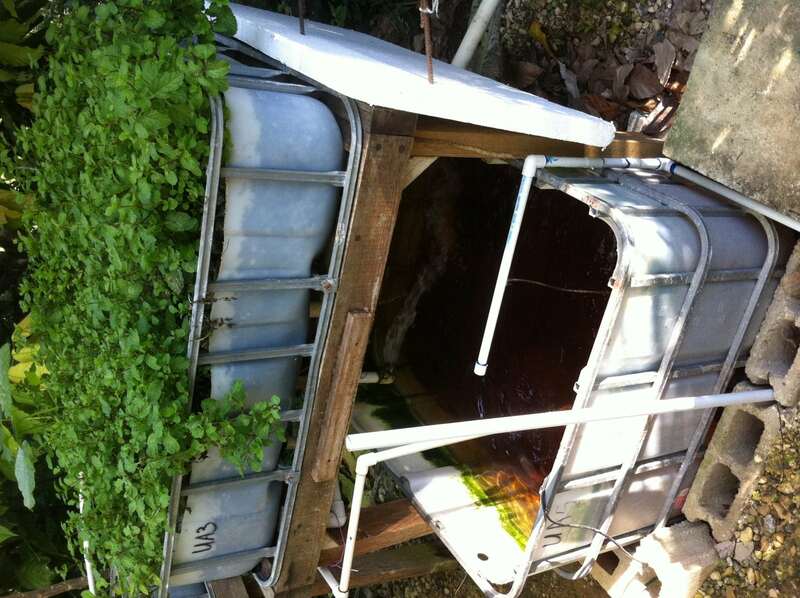 The IBC tanks are popular with do it yourself aquapoincs systems. Our commercial aquapoincs systems are divided into 2 x 2000 gallon tanks and raft beds. We have 3 commercial systems including one system at our secondary location on Kite Beach, Cabarete at the eXtreme hotel. The commercial aquaponics systems are for fish from months 3 – 12, and provide much of the produce that ends up at our farm to table hotel system.